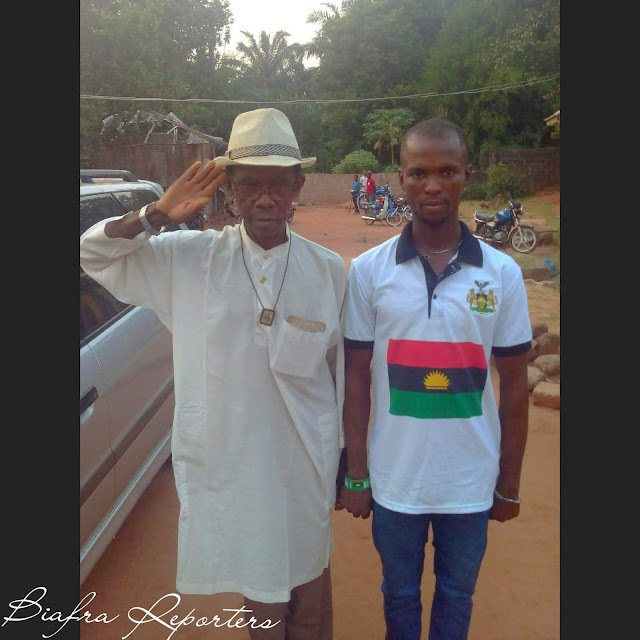 Chima Onyekachi and Ifeanyi Chijioke met with a Biafran veteran from Ichi community in Anambra State, he recounted his experience as a captain of the Biafra Army and also dared President Muhammadu Buhari of Nigeria to a gun duel for the sake of the restoration of Biafra. Can we know your name Sir? Did you participate in the Biafra-Nigeria war? Yes, I did. I was a Captain in Biafra Army. Give us a brief recount of the war. We, the Biafrans fought bravely even with the little weapon that was in our possession. We did not fight by our powers alone, God Almighty was with us in the fight against the Nigeria Army which was made up of mostly Hausa/Fulani people. It is not everything that happened in the war that was spoken on radio or written on newspaper. As a Captain in Biafra Army, what was your duty and where was your battle front? I was in 29 Battalion, A-Company in Onitsha. I was a gunman and an intelligent officer. I acted as a spy because I spoke Hausa, Yoruba and English language fluently. Can you recount the number of enemy soldiers you shot dead during the war? (laughs) You have to understand that during a war, you cannot count the number of soldiers you have killed. As an infantry, you may be hundred in number and your rivals may be in thousands, you will be on opposites sides shooting against yourselves. There is no way you can count how many soldiers your bullets have killed. Except in a close combat, that is when you will know you have shot someone dead. There is a particular experience I cannot forget, there used to be a tough Major from Chad, he is tough in the sense that whenever you shot at him, the bullets do not penetrate his body, he was immune to bullets. I got angry when he killed one of my closest men whose duty was to load bullets into my rifle. I swore to revenge and volunteered myself to kill that Major from Chad. I stripped myself and picked up my gun, I searched for the Major and shot him dead. How do you feel over the extra-judicial killing of Biafrans by the Nigeria security forces? I feel very bad that I am now old, even older than Muhammadu Buhari who is in his seventies. I am in my eighties but that does not mean I cannot shoot a gun in defense of my people again. What do you have to say about the non-violent approach of IPOB towards the restoration of Biafra, even as protesters are been killed by the Nigeria security forces? The struggle for the restoration of Biafra anchored by IPOB is that of wisdom. It is a crime for the Nigeria security forces to be shooting at unarmed peaceful protesters. I can tell you that I am not happy about that, if it can be allowed by the leadership of IPOB, let the youths be allowed to defend themselves against those killing them. The pains and injuries inflicted on us during the genocide of 1967-70 is yet to heal but they have continued to kill us. How do the veterans see Nnamdi Kanu even as he has not picked up arms against the Nigeria government? We (the veterans) see Nnamdi Kanu as another Ojukwu, he is sacrificing his life for the freedom of his people. Most of our people do not understand what Nnamdi Kanu is fighting for, especially those with investments and properties in other parts of Nigeria. Those of us who fought the war did not think of our wealth or properties. If anyone from Biafra does not support the independence of Biafra, that one is advised to park to the north or wherever he wishes. Look at most of the governors, some are already campaigning for second tenure but they are the ones mobilizing the security forces to continue to kill their own people protesting peacefully and unarmed. Nnamdi Kanu is more wealthy and educated than most of us but he has given himself as sacrifice, what stops us from giving him our support. It is painful that our children are been killed continuously and more painful that Nnamdi Kanu is being detained illegally when he has not committed any crime. How do you feel about Muhammadu Buhari been the President of Nigeria after participating in the Biafra Genocide of 1967-70 and now he has also given directive for the shooting of peaceful Biafran protesters? I do not feel happy about that. Many of our people don’t know the plans of Buhari against us. Buhari has no agenda for the development of Nigeria but his sole motive of becoming President is to propagate the Islamisation of Nigeria. During the war, Buhari felt the strength of the people of Biafra and he ran away from the battle field. If it will be possible for him to come out and face us again in battle, he will still run away, that I can assure him. But there are tales that the Nigeria forces defeated the Biafra Army in battle and they surrendered (cuts in) Nigeria never defeated Biafra in the battle field. We were deceived by Zik (Nnamdi Azikiwe) to believe that peacekeepers from OAU (AU) were coming into Biafra Land. It did not take up to five minutes General Ojukwu left the airport, that the so-called OAU peacekeepers brought by Azikiwe landed in Biafra Land and then Major General Effiong has taken over as head of state. Was it the peacekeepers from OAU that ended the war? Not at all, it was just the will of God Almighty for the battle to come to an end. The Hausa/Fulani soldiers were already tired due to the effect of the dreaded ‘Ogbunigwe’ bomb against them. More of those bombs were in full production. The generation that did not experience the war are clamoring for war since they are been killed unjustly for protesting peacefully, what is your advice to them? What I have to say about that is, it is not about the shooting of guns that matters now but the use of wisdom. This generation has used wisdom to bring attention into the struggle by making the international community to become aware of the atrocities against Biafrans. I believe the international community is seeing the pictures and videos of the extra-judicial killings of Biafrans, they must speak out someday because they cannot be silent for too long. As an elder in IPOB Ichi family and also a veteran, does it annoy you that Biafra was not restored earlier? It annoys me but I take solace that it was not ordained to be restored then. I remember we were defensive but when we went on offensive against the Nigeria forces, everything began to disintegrate. So do you believe that Biafra will be restored this time? It is not about believing; Biafra is here already. We are in Biafra already, there is nothing that can stop the restoration this time because it has been ordained to be restored this time, come rain, come sunshine. I will advise those still interested in their investments and properties to be aware that Biafra is no longer in the past but in the present. Before long, Biafra will be restored. What have you to say to the leader of IPOB, Nnamdi Kanu? I want to ask God Almighty to continue to protect and strengthen him. His sufferings for the sake of his people will not go in vain because he will be alive to witness the restoration of Biafra. He has been chosen by Chukwu Okike Abiama (God Almighty) to lead his people to Biafra Land. Chukwu Okike Abiama will keep him because whatever a father cannot finish, his son takes over from where he has stopped. General Ojukwu and other veterans started the journey to our freedom with guns, these generation will finish the journey with wisdom and use of technology. As you can see, the economy of Nigeria is down already, signaling the restoration of Biafra.